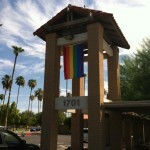 Community Christian Church in Tempe, AZ, displays it's Pride and Welcome! After graduating from Brite Divinity School and becoming an ordained minister in 2008, I was excited about entering the search and call process to see where God would lead. In hindsight, I was a little too naïve about the reality and complexity of life in the church. I had a somewhat sheltered experience at Brite, which celebrated and welcomed the diversity of God’s creation as part of their theological ethos. I had a supportive sponsoring congregation in South Hills Christian Church in Fort Worth, Texas. I was not prepared to encounter the harshness of the hetero-normative world of the larger church. After spending three years in the process with no call, I began to question this institution called the “Church” and its relevance and validity in the world. As I read public mission statements from churches of their “welcoming invitation and hospitality,” I knew it did not apply to me, a minister who also happens to be a lesbian. It was difficult to hear search committees say how they were interested in having me as their minister— until I revealed that additional piece of information and they subsequently closed the door on further conversation. In many of our churches, the message of intolerance trumps the gospel message (no matter what the public mission statement says). However, I also realized that the church, though a gift from God, is an institution and a system, susceptible to the systemic sin that permeates all human institutions. The key for congregations is to recognize their own culpability in promoting an atmosphere of heterosexism (and racism, sexism, classism…you get the picture) that leads to an anti-gospel message shared with the world. Lest this writing devolve into a diatribe, let me say that although hurtful in many ways, the search and call process did allow me to discern further God’s call upon my life for ministry. Friends and professors helped me see the gifts of God that came with scholastic aptitude and encouraged me to view ministry in the context of the academy. Consequently, I returned to Brite where I am finishing a Master of Theology in History and Theology degree and will begin PhD work in the fall in the history department at Texas Christian University. I anticipate that my future ministry will take place in the classroom, educating the next generations of leaders in the church. There is a bit of irony in my story, which I lift up to help the church recognize the need for wholeness in a fragmented world. As I possess a Bachelor’s degree, two Master’s degrees and anticipate a PhD, I think of my dad. I can understand to some extent why he, and consequently the rest of the family, did not attend church. My dad dropped out of school after the 8th grade and spent most of his life working as a roustabout in the oil fields or working on a road crew for the county. My dad did not drop out of school because he was not smart; it was because of treatment towards him thanks to biblical literalism taken to an extreme. Dad told me that he grew tired of teachers hitting him on the hand with a ruler when he tried to write with his left hand instead of his right hand. You see, back in my dad’s day, there was the notion that right-handedness should be the norm because left-handedness was associated with being ungodly. For hundreds of years, Satan has been associated with the left hand in various ways, often portrayed as being left-handed in pictures and other images. Christianity has a bias towards the right hand—one almost gets the impression that God is right-handed from all the biblical references. When my dad was growing up, people tried to “cure” left-handedness in children by forcing them to write with their right hand, a practice that rendered many left-handed people with problems of dyslexia, stuttering, or other forms of motor difficulties. Because of these “conversion” practices, my dad developed a stuttering problem. Oh yeah, I forgot to mention that one reason my dad wrote with his left hand was that he was born with a deformed right hand that made it difficult to hold objects like a pen or pencil. So, not only was he labeled as being associated with evil, he was forced to display a disfigured feature of his physical nature that also brought a social stigmatization. As he got older, my dad did find solace, comfort, and acceptance within the community of his family and the friends he made at work. When my dad passed away, some of his siblings were uncomfortable at the viewing with his disfigured hand displayed prominently across his chest. My mom explained to them how over the years he had come to accept this part of himself and had grown more comfortable with this feature being noticeable in public. My dad did not let biblical literalism rule his life, and neither will I. I recognize that I am who and how I am because that is the way God made me. Thanks be to God for the diversity of God’s creation. May the church do its part to recognize that diversity and embrace it. Previous PostOur Common HumanityNext PostStraight Privilege/Gay Penalty?